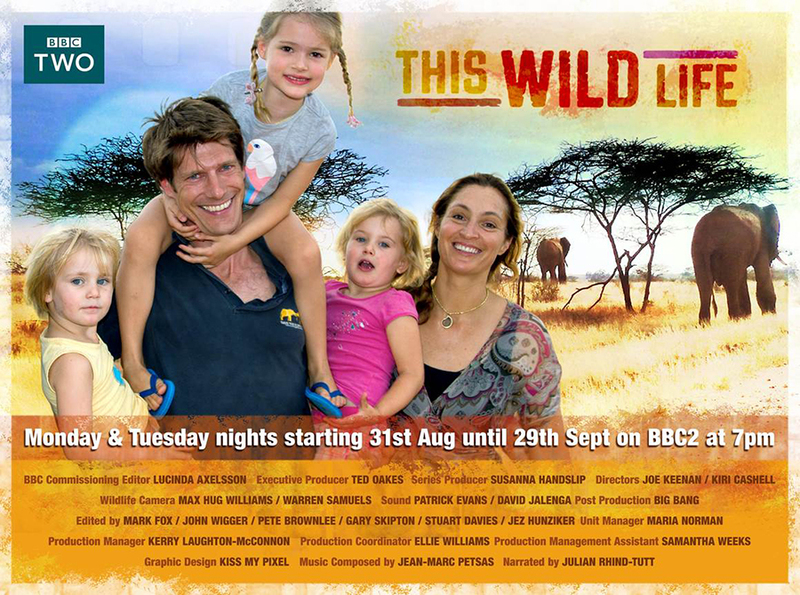 We’re delighted to announce that the new 12 part BBC series – This Wild Life – starring our amazing teams at Elephant Watch Camp and Save the Elephants, has hit TV screens across Europe and will soon be in the UK! It’s already been showing to great acclaim in Austria, Belgium, Germany, Norway and Turkey, and will soon be in Italy, Sweden, Romania, Israel, and China! We hope it’ll inspire you all to come to Kenya soon to experience the open vistas, starscapes and exquisite wildlife of the northern frontier for yourselves. Excitingly, the UK broadcast is scheduled to start on the 31st August at 7pm, and will run throughout the month of September every Monday and Tuesday evening on BBC2. So just as the kids go back to school, there’s somewhere marvelous to escape to on the telly! Filmed in the wild frontier of Samburu National Reserve, This Wild Life captures the humour, passion, beauty and heartache of what it’s like for a young couple with small children to live in the bush running a high-end safari camp. Amidst a fascinating array of nomadic tribes in an endless, open landscape, Saba Douglas-Hamilton and Frank Pope work around the clock, with a team of irresistible Samburu warriors, to enchant their guests with the beauty of the wild world, and meet the challenges of seasonal floods, monkeys running havoc in the kitchen, and some very territorial bull elephants, head on! We hope you’ll enjoy this light-hearted behind-the-scenes glimpse of life in Samburu, and we encourage you all to come and experience this “wild life” first hand at Elephant Watch Camp! Watch this 1-minute video teaser of three elephant bulls less than 3 metres away from us around the back of Tent 3 at Elephant Watch Camp.